I found this site while on a completely random search. It's not really about comics or animation, and just a little bit about design, but I'd feel deficit if I didn't pass it on nonetheless. It's like a handy primer for those of us that don't read The Bible. Find out where you'll end up! 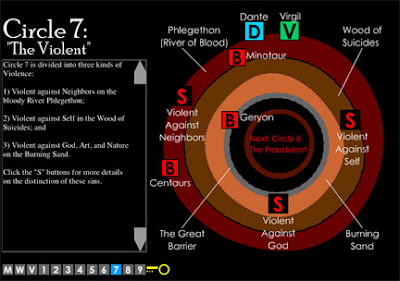 I'll see you guys in Circle 6: The Heretics. They have a sweet wet bar. Warning: The site is a bit hincky in the Flash dept. "Skip" the first page. I just did the cover for the next issue of Other Magazine, which is about Dead Magazines: those publications , that for some reason or another peter out, or never really made it in the first place. 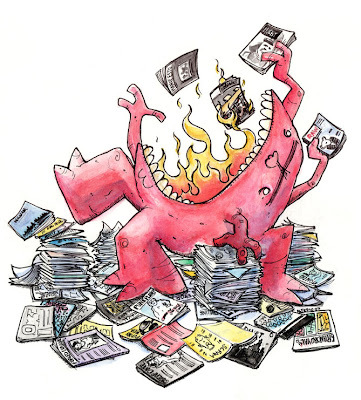 And with a failure rate of over 75% in the periodical industry, there's plenty to chose from. This cover was fun to do: thanks for everyone's help finding fave magazines and 'zines that are no longer with us. Keen eyed observers will find my short-lived 'zine, Manifesto, has a pretty good spot in the image. Well, hell, I gotta do SOMETHING to commemorate all that time and effort, right? In a move that immediately shoots to near the top of the list of Business Decisions Perhaps Performed Under The Effects of Some Serious Drugs, (and there's some serious competition), Little-Brown has just announced that they will be releasing Tintin in the Congo in English, apparently deciding that American won't truly be ready to plunk down 10 bucks to see the new movie until they have a deep understanding of his racist past. Besides the questionable nature of packaging it as they would any other Tintin (I could see it released as a scholarly work for cultural examination, but are they really planning to plop this down next to Explorers On The Moon in the kids section? ), the greater question has immediately been raised, which is, does a racist past invalidate a piece of art? 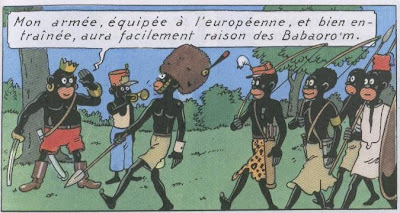 For those not in the know, Herge's second foray into Tintin adventures, (the first being the deeply surreal and anti-Bolshevik Land of the Soviets) takes place in the Belgain Congo, and is a mishmash of uncomfortable stereotypes, cartoonish buffonery, and deep-seated ignorant carictures of the Congolese people specifically, and black folks in general. You don't need too much imagnation to get the loathsome gist: bones through the noses, fear and deference to the white man, and Tintin playing the good European and teaching the locales "manners". It is the worst type of repulsive racism. It was also 1930. Now, I won't be labeled a defender of Herge's racists proclivities, or for any in the popular media, for that matter: any of you that know me, know my dedication to dismantling of the machinery let allows such odius thoughts to propagate. However, the underlying question proves trickier. Can someone extricate themselves from past mistakes and regain respect, espcially if so much of their art and lifework was for good? I'm not a big fan of the word "hero", and I think one can appreciate and respect the work without respecting the artist: so many of my favorite works have been created by mosogynists, drunks, abusers, liars, adulterers, thieves, and monsters of every stripe, it's sometimes seems a wonder you can find any artist at that is a stand-up citizen. So I don't let that make me blue: I'm adult enough to separate the creator and the creation. But what of Herge? Does it matter that he expressed shame and embarassment the rest of his life for those earlier follies? Do mistakes of such a catastrophic nature get forgiven as youthful ignorance? And perhaps even the biggest question: if it didn't become socially unacceptable over his lifetime to be a racist, would he still have renounced the work? I can't answer these, nor can anyone, they're merely food for thought. But I beg of you, those that will no doubt be exposed to that hateful book in the coming months; let the work, not the worker, speak to you. "But, man, could that guy paint." If there's been a hiatus on this blog (and there has), I can't chock it all up to a huge amount of work, or tireless invention, or even blogger fatigue (though they do take part) - the summer of 2007 has become the Summer of 1001 Engagements: weddings, graduations, bachelor parties, brises - they all have taken me away from the unholy, never-sated maw of The Blog (ok, maybe not the last one). That said, I've been back to my home, in Boston, several times in the last few months, and while there, I usually stay at my mom's place. And therein lies the problem. First, a few caveats: I love my mom, in all of her glorious weirdness. Normal moms leave me a bit cold; to what other mom could you come home to at 2 AM on a Tuesday from a night of drinking, to find her painting on Polaroids, a pot of tea on, with a Werner Herzog movie on the television? Not many, I would hazard. And secondly, I know my mom will never, ever read this, unless someone prints this page out and gives it to her, because she avoids computers like other people avoid boiled giblet stew and tongue sandwiches (two faves of Mom's). You'll excuse my apparent immodesty-by-relation or whatever you want to call it, but my mom also happens to be one of the greatest painters I have ever seen let alone met, and, I would hazard, one of the last true romantic painters out there. I say this without pretense to fame, without name-dropping, and without really any askance of someone else to confirm it. I know it is true. I challenge anyone, be they first year art school student or longtime curator at one of the great museums, to come and inspect the piles and piles of jaw dropping working that lays about our home. I can assure you they will come to the same conclusion: she occupies a realm of talent, dedication to craft, and patience, that sometimes seems to have left this world long ago. The one oil we have hanging in our house regularly causes visitors, be they art directors or handymen, to stop in their tracks and gawk. Her work is that striking, and yes, she is that good. Additionally, I can also assure you she will never be known for it. The history books lie closed to her. For one thing, my mom is the very antithesis of self-promoter. But more than that, the amazing thing is that she doesn't seemingly yearn for that recognition. She does it because she can't do anything else. She paints, because she paints. That is all. In our world of resume advice and marketing seminars, I admire the hell out of that. It seems like such a quaint notion: doing what you like, for you. I was sitting in what was my sisters room at one time, and is now the guest bedroom, the other weekend, and the subject of painters came up. She is a ferocious Impressionist fan, but not in the gross, sorority-girl, everyone-has-a-print-of-Water Lilies way. She could give a crap about the subject matter. Hers is the eye and recognition of a tradesman, a draftsperson, one who understood what incredible vision, and yes, talent it took to assemble such images out of seemingly random lines. What a deep understanding of visual cues, what a keen way to observe the world: the break down a reflection on a jar with a stroke just so, and just so. Beyond whatever art school claptrap they teach you about the Impressionists, comes through a deeper understanding of what it was they did, each action, each specific mixing of colors, back when paint didn't come prepackaged in 90,000 colors. She appreciates the actual work of it. I am nervous when it comes to art talk with my mom, not only because she knows so much more than me, but because she so much more of a talent than I am. After her diatribe about her amazement at the great painters, it was my turn to be put on the chopping block. I asked about imagination, that surely the current crop of comic artists and skateboard painters, the printmakers and Pop Surrealists, they had an imagination to the work that made up for the oil painting that took monthes to create, surely the intellectual breaking out would somehow take the impressive place of a nineteen hour sitting with a Pope. She shrugged her shoulders. In a roundabout way, I asked her if she respected what I did, viewed what I did in a similar vein, that I too could be included in her codex of art. She told me she was jealous because my work took so much less time. And I still got paid. And still, we struggle on. Yeah, they totally killed the black Transformer. Spoiler alert - Jazz dies in the new Transformers movie. They killed the Black Sidekick. Amazing. 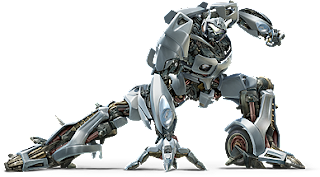 I'm surprised the Transformer who was good at inventing things didn't have an Asian accent. But the movie? Surprisingly good. I mean, at least they didn't take themselves too seriously. Best line of the night: "We learned that the humans, like us, are more than meets the eye." Booo!